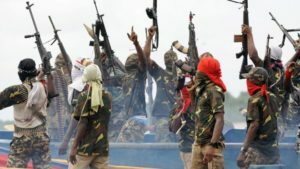 Niger delta militants (Image copyright/AFP) The oil-rich Niger Delta has been badly affected by instability. Nigeria will invest $10 billion in its oil-rich south to end an insurgency by militants, the oil minister has said. The money would be used to build infrastructure, including roads and railways, Emmanuel Ibe Kachikwu said. Militant attacks have severely disrupted oil production, fueling a recession in the West African state. The militants have been demanding that the government spend more of its oil wealth on tackling widespread poverty in a region, known as the Niger Delta. They also accuse multinational firms of polluting the environment, destroying the livelihoods of farming and fishing communities. Kachikwu said that President Muhammadu Buhari would meet the militants and community leaders next week. The $10 billion would “not necessarily” come from the federal government, but from “oil companies, investors, individuals,” he is quoted by Reuters news agency as saying. A new militant group, the Niger Delta Avengers (NDA), emerged after President Buhari, a northerner, took office last year after winning elections. It has carried out a spate of attacks on oil plants and pipelines, causing a sharp fall in oil production and worsening the financial crisis in Africa’s most populous state. Buhari’s predecessor, Goodluck Jonathan, came from the Niger Delta, and managed to broker a peace deal with militants in the region. The militants accuse Buhari of reneging on the deal, an allegation he denies. Oil is the Nigerian government’s main source of income.